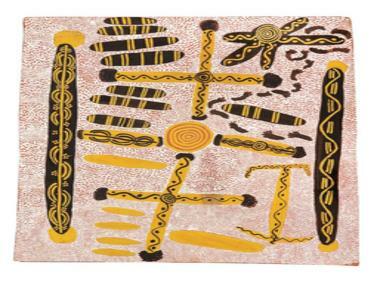 Mossgreen Auctions produced one of the best Aboriginal art auction results in recent times with their auction of Indigenous art from the collection of John W. Kluge which achieved an amazing 100% clearance rate and a sale total of $787,485.60 against an estimate of $330,900.00. The Mossgreen sale had been tipped to be a huge success since being announced because of the fact that the works in the sale came from collection of John W. Kluge, one of the most renowned collectors of Aboriginal art. Collectors and investors displayed an enthusiastic response towards the catalogue which had quality, provenance and rarity in spades – characteristics that have proven to be the driving force of the market for Aboriginal art. Some of the most hotly contested lots were those with provenance associated with Geoffrey Bardon, a man who is often credited with the development of the modern Aboriginal art movement. Combined with the Kluge provenance, the Bardon provenance provided collectors with an opportunity that was too good to miss. The Geoffrey Bardon association pushed lot 21, a painting by Clifford Possum Tjapaltjarri of a story for whom artist Tim Leura Tjapaltjarri is the custodian, to a total of $92,400 against an estimate of $30,000-40,000. Titled Bush Tucker Dreaming in the Sandhills, the collaborative work of two very highly respected and important Aboriginal artists was originally commissioned by Bardon in the early 70’s. 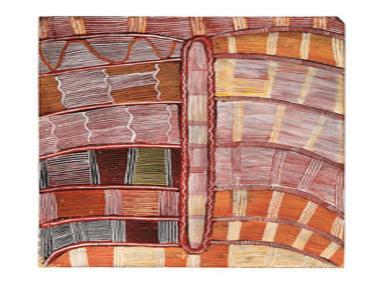 Lot 39, Mick Namarari Tjapaltjarri’s Sandhill Dreaming, fetched the second highest price of the sale reaching $85,800.00 against an estimate of $35,000-45,000. Estimated at $30,000 - AU$40,000, Uta Uta Tjangala’s Big Corroboree with Water Dreaming Sacred Tjurungas again blitzed the estimate with a final price of $72,600.00 and the third highest price of the sale. Fourth highest price went to Anatjari Tjakamarra’s Snake Dreaming which sold for $48,840.00 against an estimate of $20,000-$30,000.